We offer many different products and styles including some of the best brands like American Apparel, Bella+Canvas and Next Level. We spend a lot of time testing each product carefully considering the best possible decoration method. Every product on our site shows what our customers say about the fit. We recommend starting there. We also created a great video to help you with your sizing needs as well. To get an accurate size, your best bet is to find an item you own and love. Then, compare its size to the size chart of our product. If you need a t-shirt, for example, find one at home, lay it flat, and measure it in inches. Then match those measurements to our size chart. Unfortunately, every t-shirt maker in the world has some degree of manufacturing tolerance, which is to say, the distance in inches could have up to a 10% variation, plus or minus. If you want to be absolutely sure about sizing, feel free to contact us to order a blank items. You can then try it on, and then return it. We will refund the item price, but we cannot refund any shipping costs. What type of clothing/fits do you offer? Slim Fit These shirts are cut to fit closer to the body and they run small. Relaxed Fit When compared to Slim Fit, Relaxed Fit shirts are cut with a more generous fit, which means they will fit more like a basic t-shirt. Compared to a Unisex shirt, a Misses fit tends to have shorter sleeves and a more feminine cut. Flowy As the name implies, these shirts offer a flowy, loose fit that works with almost all body types. They are also very trendy. Plus Size These shirts are true plus sizes. They come in 1X - 4X (some retailers would label these as Plus 1 - Plus 4). Unisex These are in our Mens/Unisex Tops section. These shirts offer a roomy fit for all genders. Maternity These shirts are for pregnant women. We always recommend reviewing the size chart for each item before making your purchase. This information is located on every Product Details page. Can I order sizes not available on the site? If you do not see the size you are looking for, that product is most likely not offered in that size. But you can always contact us and we'll see what we can do to help you find the right size! Please follow the washing instructions on your item's tag, washing inside-out is also suggested. Some items which have metallic applied do call for handwashing. You may notice your item has an eco-friendly pre-treatment applied before printing to keep your design vibrant and long-lasting. Simply wash the item and it will be ready to wear! Can I put my same design on other products? - First, choose an item and create your design. - Next, click Add to Cart. - Once in your cart, click the "Copy Design" button. This will take you back to the Design Center. - Next, click the Swap Out Item tab, and choose another product. Make any adjustments to the size and location of your design. - Click Add to Cart again, and you're all finished! For the best printing quality, upload the largest image size you have. We recommend images of at least 1000 pixels in height and width. What is the Name/# tab? The Name/# tab in the Design Center can be extremely helpful when ordering group or team items! Here's a great video explaining how it's done! Can I use emojis in my design? We strongly recommend using the emojis available in our Add Art tab instead of using your phone to add Emojis. In the design center, choose the Add Art tab and then choose the Category menu. You will see "Emoji" as an option, with lots of subcategories. We have a huge selection of emoji art that we hope you will love. If you add the emoji icons from your phone using the Add Text tab, we can't guarantee those results, because every system renders emojis differently. If you don't see your preferred emoji in our Add Art tab, just contact us and let us know. We'll do our best to help you out! Designs will remain in your shopping cart for 7 days, as long as you are signed into your account. Don’t worry! We’ll send you a reminder that there are still items in your cart before they are removed! If you need to purchase at a later date, it is best to save the design to your account. To save your design at any time, simply click the "Save" button in the Design Center. You must be signed in to your account to save your design. How do I find my saved designs? Sign-in to your account. Then click "My Account" in the header. Then click "My Designs". How do I share a design? If you want to share a design from our gallery, you will see buttons for Facebook, Twitter, Email, Text, and Pinterest on the design details page by clicking on the design name (ie. 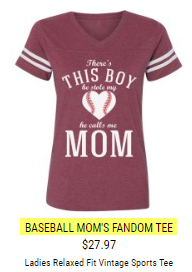 Baseball Mom’s Fandom Tee). Once your design is saved, this will allow you to share it with friends via email or on social media. You can use the share buttons on the design details page or simply copy the URL and share away. Your design will not show up in our galleries, which means it will not be searchable on the site. Another way to share designs is by clicking the "Share it" button next to the "Save this design" button inside the Design Center. Can the white background be removed from my design? If you would like us to edit your image in any way, or you just want to make sure we remove the rectangular background, please leave a note in the Special Instruction field that you will find near the end of the checkout process. How do you print my items? We have three different printing methods, each tested and the best selected for each garment we provide. Printing ink with a direct-to-garment digital printer. Using an ultra-thin, precision-cut, heat-pressed "film" material. This is a great method to create a durable design on unique items. For example, it's not possible to create custom, no-minimum designs using ink on items like duffel bags and mesh jerseys. We use film instead, and it works nicely. Items decorated in film offer a wide range of specialty options including metallic, glitter, neon, and glow-in-the-dark. As a customer, you probably don't want three or four layers of film overlapping each other on your item. To avoid this, we limit the design center to one text style and one piece of art for film-only items. We use sublimation on our hard-good accessories such as custom mugs and shot glasses as well as some garments. It involves printing ink onto a very special transfer material and then applying that print to the item in a fancy heat press. Sublimation results in very vibrant colors. You will usually notice that pinks and reds are brighter on mugs than other items. White is not available with this process. If the item is white (like most of them are) that will be transparent and show up as the item’s color. However, if the item is metallic pink, the white will be transparent and show up the metallic pink of the item. Will items print like they look on screen? The design will print proportionate to how you see it on the screen. Please keep in mind that we print in a design boundary that will not wrap around the body, so if the print looks smaller than anticipated, please try on the item to see the design’s actual size once worn. What are the best print locations? If you want your shirt to be printed using standard print locations (such as full chest or left chest), please use the graphics on this page as a guide when creating your own design in the design center. For the most part, we will print everything exactly as you designed it. However, we might adjust your design slightly if you are clearly aiming for a certain standard. For example, if a design looks like all of the elements are centered, but our art department notices one element is slightly off-center, we will go ahead and center everything for you. When aligning your design vertically, it's all about centering. Try to get the center of your design to align roughly near your armpits, while also staying within the "full chest box" above. Look at the examples below. The green dashed line is the centering armpit line. For shirts with low neck lines, like v-necks or some tank tops, the top of the design usually starts at about 3/4 inch from the collar. If you have any specific requests, be sure to add them to the Special Instructions field during checkout. I want this to be a Left Chest design. Our art department will use the Left Chest standard to make sure your design looks like a classic left chest design. See below for more do's and don'ts when using the design center. If you really want your design to be printed on your belly, and you want to be extra sure that we know it, please leave a message in the Special Instructions. For maternity designs, it is usually clear when the design should be printed on the belly. Those are no problem. If you have an account, just sign-in, and then go to My Account and click "My Orders". If you don't have an account, just go to the Track Order page and enter your order record locator and order number from your confirmation email. Absolutely. Our website is 100% secure! We do not store any credit card numbers in our database. Our website is also scanned daily by Qualys Secure to ensure safe ordering. Do you offer group or bulk discounts? 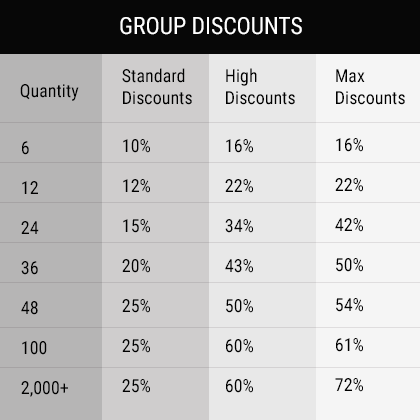 As soon as you add 6 items to your cart, group discounts automatically kick in. Unlike screen printers, they don't have to be identical. Discounts are applied to any 6 items or designs. With every new item you add to your cart, the discount will get bigger, and the price will drop. We highly recommend starting with our High Group Discounts items. Learn more about our Group Discounts here. Orders shipping to Ohio will be charged 7.5% sales tax. Starting July 1st, 2018, the goods and services tax (GST) of 10% of the total will apply to orders less than $1000. Over $1000 will be collected at the border. You can enter your promo code on the lower right side of the shopping cart page. Simply enter your code and click "apply". Your discount amount will then show up right there in the cart. We recommend signing-up for our email newsletter at the very bottom of any page because we regularly send out great coupon codes for discounts. Our promo code technology is pretty smart, so when you enter your code, you will automatically be given whatever discount is the greatest. For example, if you have a group discount that results in $15 off, but you have a promo code for $20 off, it will use the $20 discount. Only one discount can be applied per order. - Promo codes do not apply to shipping or tax. - Promo codes cannot be applied to the purchase of Gift Cards. What is a production fee? A production fee is charged when an order is cancelled or changed after it has been printed. This is 50% the cost of the item or subtotal. This covers the cost of the goods and production time spent. Please contact us within 1 hour of placing your order to make any changes. Please double check your designs for accuracy before placing your order, because the production process starts almost right away. No! Buy one custom item or one thousand; we're happy to serve you either way. Our "no minimum" policy is something we are quite proud of because very few custom apparel websites match us in this offer. Almost all of them have a minimum quantity of at least six on most of their items. This is because those sites will only offer screen printing as an option for those items. We, on the other hand, have eschewed screen printing completely in favor of a combination of other methods, most notably direct-to-garment digital printing on soft apparel. This means we have several advantages over screen printers, including no set up fees, no limitations on number of print colors, and no minimums. You might think that because we don't screen print, we are not as competitive price-wise for large, group orders. This, however, is not the case. We know we need to compete with screen printers, so we offer steep discounts for group orders on our most popular items. This is particularly exciting for our customers because it means they can get full-color printing on group orders for incredibly good prices. We currently accept Visa, MasterCard, American Express, Discover, Amazon Pay, and of course, our very own gift cards. If you already have an Amazon account (with addresses and credit cards saved in that account), then Amazon Pay makes checking out super-duper simple. This is especially true if you are on a phone. Just choose the address, choose the credit card, and hit "Place Order". That's it! We don’t offer printed samples, but because we have no minimums, you can order one before ordering for an entire group! Yes! When shipped within the US, we offer FREE Economy shipping on order of $70+ and FREE Quick shipping on orders of $100+. What are the timeframes for US orders? Click here to see a shipping timeframe schedule. We are a print on demand company, so each item you order is custom printed upon your order being placed. This means, you can select Express and receive your order within 3 BUSINESS DAYS! At checkout, you will simply select the date you need the order to arrive by. All delivery options include production time and ship time. The date you see is when the order is guaranteed to arrive to you by! Please note when ordering, our cut off time is 3:30pm EST, so the dates at checkout will change at this time. If you have additional questions about timeframes, dates or costs, please reach out to our friendly Design Guides and we are happy to assist! At this time, we are not able to offer rush shipping for Bahamas or Virgin Islands. We apologize for the inconvenience. Please note, you are responsible for any duties or taxes that may be applied to your package after it has left our facility. The shipping costs incurred include production time and shipping cost to get out of the country, and do not include export taxes. What is an Out of Area surcharge? Out of Area surcharges are charged collected by FedEx in order to deliver out of their normal delivery locations, to more remote locations. This does not mean they never deliver to you, however, it is out of their norm. For orders inside the continental United States, the surcharge is $3.85. For Hawaii it is $12.00. For Alaska and international orders it is $27.50. For international orders it is $27.50. So sorry, we cannot ship to APO, DPO or FPO military addresses at this time. What if my country is not in the billing or shipping drop down at checkout? If you are not in love with your item, contact us within 30 days. We handle every issue on a case-by-case basis and we'll do what it takes to make it right. Please remember to review your design, spelling, names, dates and the product size chart prior to ordering. We are a print-on-demand company and all items are printed especially for you! You are welcome to contact us if you have any questions about customization or sizing before placing your order. Your item arrives incorrect, incomplete, damaged or in any way defective we will resolve the problem immediately. Simply send a photo of the issue to returns@eretailing.com and we will get a new item to you or issue a store credit! Your item arrives later than we guaranteed, contact one of our friendly Design Guides for next steps- we promise we will make it up to you. Absolutely! We can issue a merchandise credit so you can place the new order, or we can help facilitate the exchange process. Please give us a call, chat, or email and we will gladly help with this process.